Love chocolate and peanut butter? 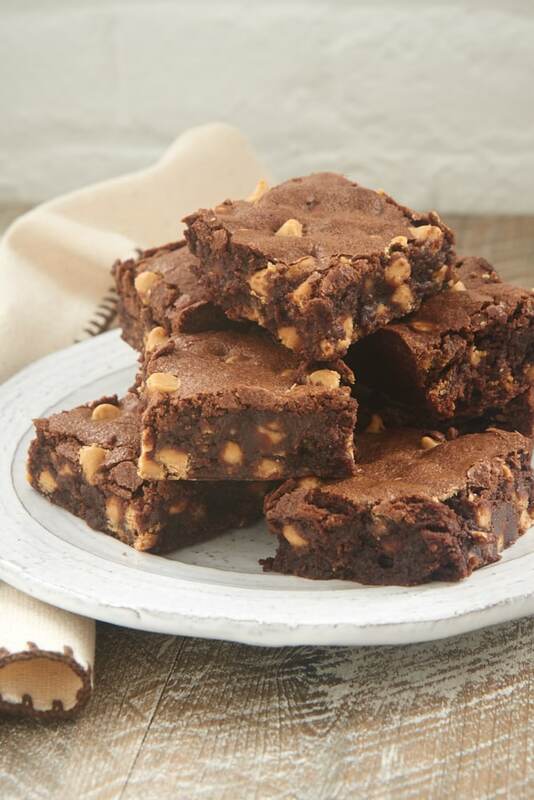 Just wait until you try these soft, fudgy, flavorful Peanut Butter Chip Brownies! We’ve been settling into a new apartment, and my baking routine has taken a backseat to unpacking and organizing. So when Quinn started making some not so subtle hints that he would enjoy some brownies, I figured it was long past time to get back in the kitchen. 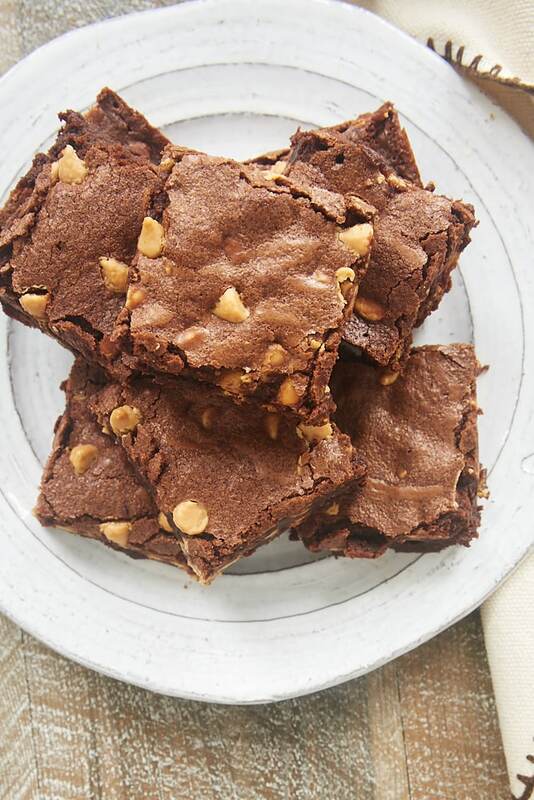 And what better place to start than these quick and easy Peanut Butter Chip Brownies? These brownies are a simple twist on a fudgy brownie I’ve made many times. (Hello, Fudgy Cookies and Cream Brownies!) They’re not fancy or elaborate. They’re just really, really good, especially if you’re a big fan of chocolate and peanut butter like I am. Peanut butter chips are responsible for all of the peanut butter flavor here. (Look for them alongside chocolate chips.) They are such an easy way to add a little or a lot of peanut butter flavor to baked goods. 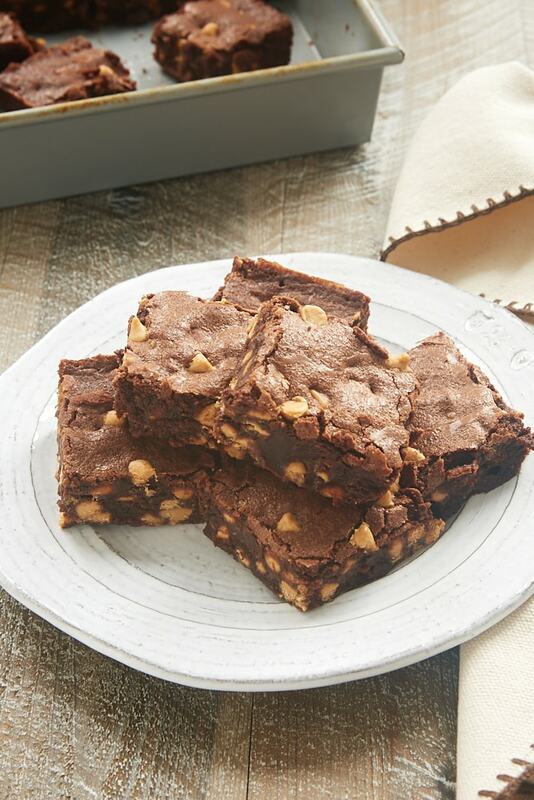 And these brownies are really packed with peanut butter chips. In fact, I’m not sure I could have gotten any more mixed into the batter. If you’d like a few less, then feel free to dial it back to suit your tastes. These brownies are made with both melted chocolate and cocoa powder for a big, fudgy chocolate experience. Plus, you get a little bit of that crackly top that cocoa powder often gives brownies. If you’re a chocolate and peanut butter fan looking for a quick and easy treat, then I think you’ll love these Peanut Butter Chip Brownies. Brownies with peanut butter chips aren’t exactly revolutionary in the baking world, but I can tell you that they 100% get our seal of approval! 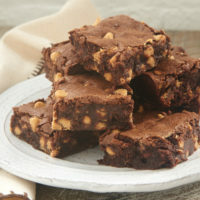 Peanut Butter Chip Brownies are wonderfully fudgy and flavorful. Plus, they’re quick and easy to make! Preheat oven to 350°F. Grease or line a 9-inch square baking pan. Place the butter and chocolate in a large microwave-safe bowl. Heat in the microwave at half power in 30-second increments until the butter has melted and the chocolate melts when stirred. Stir until smooth. Allow to cool slightly. Whisk in the cocoa powder, followed by the sugar, and then the eggs and the vanilla. Add the flour and salt, and whisk until combined. Bake 30 to 35 minutes, or until the edges are set and a pick inserted into the center comes out with a few moist crumbs attached. Cool the brownies in the pan. Then cut into squares and serve. *I usually have larger bags of peanut butter chips in my kitchen, but many brands are available in 10 ounce bags which contain about 1 & 2/3 cups. If that’s what you have available, then that slightly lesser quantity will be just fine.